COS-B was launched by a Thor Delta Rocket from the Vandenberg Air Force Base in the USA on 9 August 1975 at 01:48 UT. The orbit of Cos-B was roughly 100 000 km with a period of 37 hours. This eccentric orbit was chosen to ensure that for most of the time the satellite was outside the Earth's radiation belts. This led to an efficient viewing programme at the price of high cosmic-ray background. 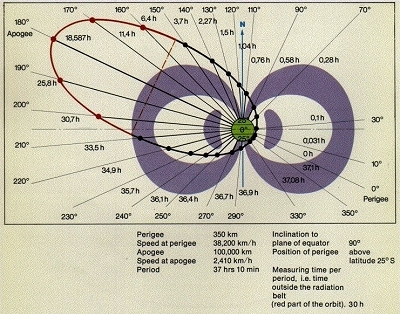 The orbital plane was inclined at roughly 90 degrees to the Earth's equator and the argument of perigee was placed in the fourth quadrant to ensure that the satellite was in sight of one of the ESTRACK ground stations. Regions of the celestial sphere which are close to the direction of the line of apsides were difficult or impossible to observe, owing to the entry of the Earth into the field of view or because the Earth-aspect angle is outside the range of operation of the albedo sensors for most of the orbit. This unfortunately included the LMC and SMC, for which Cos-B obtained little useful data. The right ascension of the ascending node was so chosen that these regions would not contain any target direction of high scientific interest. Unfortunately one such region proved to be Her X-1, hence Cos-B never viewed this region.